On October the 20th folk enjoyed a shared feast at the Lockleaze Banquet, hosted by Buzz as part of this year’s Healthy City Week. Everyone enjoyed a variety of free delicious healthy meals and many brought along a dish to share with their neighbours. Thank you to everyone who enjoyed the celebration, it was a great evening! This feast was the first of many to be hosted by Buzz; there will be a series of six shared lunches on the first Saturday of every month, kicking off on the 5th November at lunchtime (see the next flyer for details). Again all are welcome to bring a dish or simply come along and enjoy free delicious food. Buzz intends to hold this event every month to provide an opportunity to get together and share a meal. Also during Healthy City Week Buzz hosted a range of events from needle felting to dance workshops. If you wish to organise a community event and would like Buzz to host you, then please email admin@buzzlockleaze.co.uk for more details. In other news, chainsaw sculptor and wood carving expert Andy O’Neill lovingly hand crafted two Buzz bees from UK native oak wood. 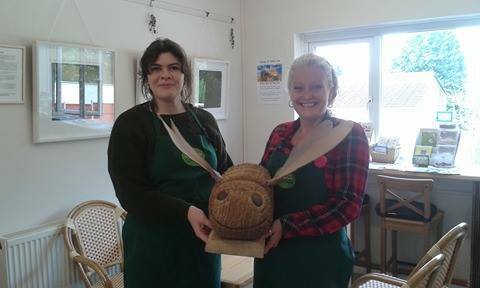 Both bees have certainly found a happy home at Buzz in the café and garden; Please feel free to come and appreciate the artist’s work! The Buzz garden now has five new raised beds! They were built and installed by the team from ABC electrification who very kindly donated their time and efforts on Friday 14th October. Their valuable work was continued by young volunteers from the Prince’s Trust, so a BIG thank you to everyone, including our resident Buzz gardening team for helping to establish a beautiful garden that will flourish from the Spring of 2017. The Buzz team look forward to welcoming you for some tasty treats in the near future.